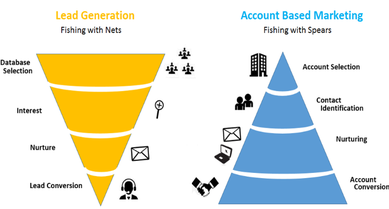 What is Account Based Marketing and Why Would You Use It? I’m a huge proponent of target marketing – identifying specific vertical markets and creating marketing strategies and content for each one. Account Based Marketing takes this to a new level. Account Based Marketing (ABM) is the antithesis to the more widely used marketing method of casting a wide net to appeal to as many companies as possible. ABM is a form of strategic business marketing where an organization takes an individual prospect or customer and treats it like its own market. ABM requires a close alliance between marketing and sales. It shifts the focus from lots of leads to highly targeted accounts that are the best possible fit for your product or service. The ABM strategy is tailored specifically for each account. ABM targets individual companies with personalized content and campaigns. It puts a strong emphasis on quality and relationship building. Instead of publishing blog posts and emails with content created for a mass audience, you would be creating content and experiences for particular people from particular accounts. ABM seeks to kick-off the sales process with higher-value opportunities earlier, get the highest ROI possible from marketing campaigns, as well as align marketing, sales, and account management for longer-term success. In many cases ABM seems to be better at delivering ROI. Research from The Altera Group found that 97% of respondents reported that ABM had a somewhat higher or much higher ROI than other marketing campaigns. ABM involves developing prospect-specific offers, developing “sales” offers designed to get meetings, personalizing experiences on your website, creating one-to-one campaigns, and other very specific tactics specifically designed for each account. ABM is not for everyone. ABM is best for companies in the B2B sector that have the time and resources to devote to tackle marketing to specific accounts. It is not intended to replace mass marketing initiatives that are geared toward driving awareness and traffic. But ABM will help drive clear ROI and measurable sales results using customized marketing campaigns integrated with sales efforts. Contact us today and see how professional marketing can help your business!